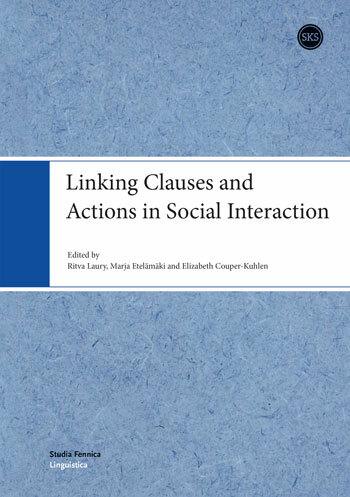 This volume concerns the ways in which verbal and non-verbal actions are combined and linked in a range of contexts in everyday conversation, in institutional contexts, and in written journalism. The volume includes an introduction which, besides presenting the content of the articles, discusses terminological fundamentals such as the understanding of the terms “clause”, “action” and “linkage” and “combining” in different grammatical traditions and the ways they are conceived of here, as well as open questions collectively formulated by the contributors in planning for the volume concerning the recognition, emergence and distance of linkage, and the ways these questions are addressed in the contributions to the volume. Topics treated in the articles include combining physical actions and verbal announcements in everyday conversation, linking of verbal and nonverbal actions as well as verbal linkages between nonverbal actions by dance teachers building pedagogical activity. Other topics concern the mediation of questions through informal translating in multilingual conversation in order to organize participation, and the ways in which student requests for clarification and confirmation create learning occasions in a foreign language classroom. Still other articles concern the on-line emergence of alternative questions with the Finnish particle vai 'or', delayed completions of unfinished turns, the transforming of requests and offers into joint ventures, and the ways in which direct quotations are created in written journalism from the original talk in the spoken interview. Most of the papers employ Conversation Analysis and Interactional Linguistics as a theoretical framework. The languages used as data are Finnish, English, Estonian, French, Brazilian Portuguese and Swedish.